This is Archive Page 30 | Close this window to see the News Archive Menu. Can Briggensians.net Help Mend Tennis Court Net? 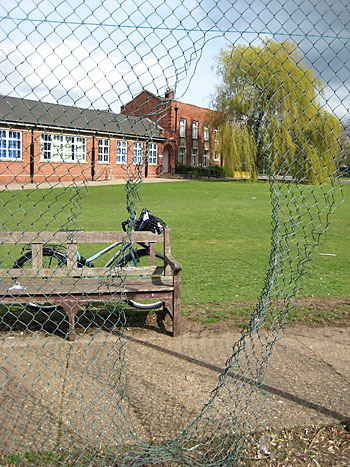 The netball/tennis court netting at the Lower School site is in a bad state and unfortunately there is no money to repair it, reports our Membership Secretary Helen Cresswell. To replace the netting on the whole court in PVC (as it is at present - see the photograph) would cost £3408.00. To replace just one side in stronger netting and carry out some repairs to the rest would cost £1998.60. Are there any Briggensians who could sponsor (in part or whole) a repair job or assist us in some way to reduce the cost of the repair? If you have a Brigg schools connection but aren't a member, why not join the Briggensians? The Rounders Match is on Tuesday 14th June at 6.00 for 6.30 pm on the School field as part of the Summer Sports. Everyone is most welcome to join in.
) if you wish or you can just turn up. In the event of wet weather the match will be postponed a week . 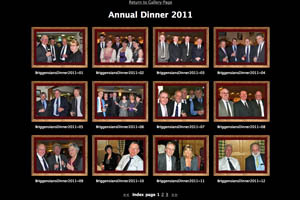 A Gallery of 26 photographs from the Annual Dinner held at Elsham Golf Club on 19th March is now available for viewing on this site. Thanks to Dave Brittain who took them - with the possible exception of the one he appears in. There is a link at the top of the Gallery Page or you can access them directly by clicking the image on the left. Send us your news - in brief or longer form - Send us a photo to go with it! I was at the Girls High School 1971 to 1976. The 6th form has many happy memories for me. As well as getting the qualifications I needed, I can still remember the 'illegal' meetings with the boys at lunchtime by the dividing fence between our school and the Boys Grammar school next door, and the cross country runs where we would go to a classmate's house nearby, have a coffee, then run back to school, slapping our faces to make them red and look like we were tired. Maybe I've said too much but I have lovely memories and although he may not know it, Mr Howitt inspired my passion to dedicate my life to helping other people. It was interesting reading about Mark Leaning in the February 2011 newsletter - Mark may remember he and I met up when we both did summer jobs at the old British Steel and ended up going to the Isle of Man Grand Prix for a week of watching motor bikes in the rain and excessive beer consumption. That's over 30 years ago. It's really sad to see so many old schoolmasters have passed away in the past two or three years. For those interested, I've been living in Sydney, Australia since 1987 and have three kids who are all now at university themselves. I've been involved in the stockmarket ever since I left university and am now, amongst other things, the Chairman of three publicly listed companies in Australia involved in mining, investment and grape growing. And the one thing about BGS I can't shake off....I still write with bloody fountain pens! My name is David Culm, who briefly attended Brigg Grammar School in the 1950s (54-56). I was 13 when I came and 15 when I left. Under the amazing tutelage of Doggy Barker in one year I learned enough German to be able to communicate lucidly 40 years later when on a choir trip to Germany. His methods were so structured and logical (difficult) that to this day his methods have worked. "Slug" Matthews was bully of a head master and Peter John Dodd was a contemporary of mine as was a Ken Grundy and John Price. One and one half penny buns were sold in the playground at break times. I lived at RAF Hemswell then (father a pilot) caught a cattle truck bus at 7.45am which went around the villages picking up boys for school (Willoughton, Kirton in Lindsey, Hibaldstow) arriving at Brigg at 845am. Funf Metcalfe taught French and very effective he was. Memories are faint but those that remain of Brigg Grammar school are favourable apart from the interminable travel to and from RAF Hemswell. Oh, and I sang my first solo during music lessons and I still sing to this day in a male voice choir in Derbyshire. I hated cross country running which Slug insisted would make us 'men'! "Just a short note to tell you that Janet died on 24th January. She was diagnosed with breast cancer in April 09 and this later became bone and liver cancer. I am absolutely devastated. I can remember her corresponding with you from time to time – you may recall she worked for several years at Barclays in Brigg. We were both contemporaries of Adrian Gibbons and Dave Brittain also knows us both." Why not send us a tribute to these or other Briggensians who we have recently lost? To send us your news or details of reunions, use the e-mail address below. The Briggensians site is currently being upgraded, with two main purposes: first, to put the news on the front page, and second, to remove most frames in order to make linking to individual pages possible. Inevitably, there will be some broken links for a while. Please bear with us and feel free to let us know about them! Jim.